What’s the deal with Goat Yoga? Well here I am, to answer all of your burning questions about goat yoga! 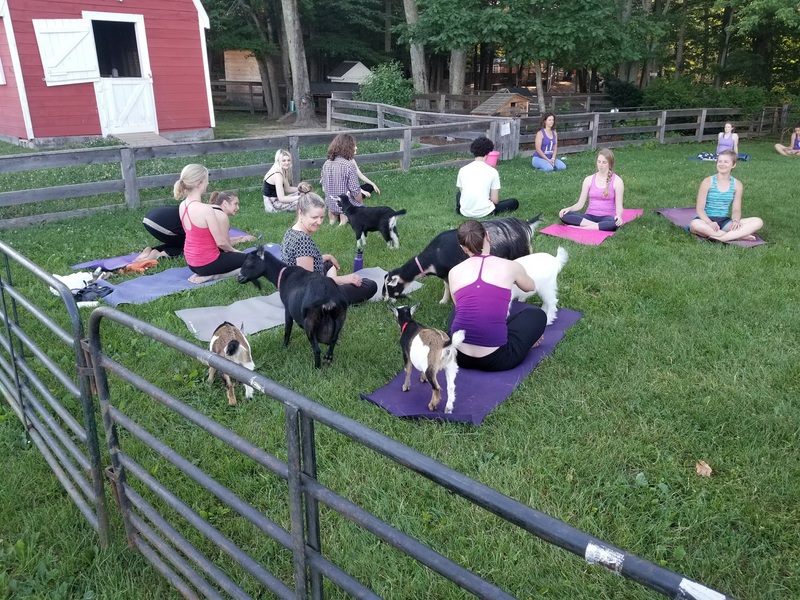 It is a yoga class, that has goats in it! Our friends over at Smiling Hill Farm set up a temporary pen for the goats (that way it’s not pre-pooped). Then we put a bunch of goats and a bunch of yogis in the pen. I teach yoga to the people, and we all laugh at the goats while they run around and do silly things. When we do downward dog pose, I will make a cheesy joke about calling it downward goat pose, but it will still be exactly the same thing. But, it is like a normal yoga class? Well, sort of yes and sort of no. It is an all-levels class, you can use a mat if you want to, yoga instruction is happening. So in that way, yes. Additionally, you can take pictures, I encourage you to do yoga if you want to, or maybe just play with the goats if that is what makes you happy. I will periodically make jokes about people’s mats getting peed and pooped on. I will encourage you to enjoy the racket of the ducks and the geese over in the barnyard, and if you are really worried about getting pee or poop on your feet, I would encourage you to practice with your shoes on. The yogis laugh, giggle, smile a lot, and take a meditative stroll during class. So in that way, no, not really. Maybe. It hasn’t happened much in this class, but if you lay down on the ground they do seem to like walking on your belly or trying to walk on your face. They also seem to like snuggling up by your feet while you practice. Will I get peed or pooped on? Not exactly. It is unlikely that a goat will actually pee or poop on your person. There is a decent likelihood though they a goat may pee or poop on your mat. Don’t worry, it washes off really easily and I have some mats you can borrow if you feel squeamish about it. But really, why goat yoga? 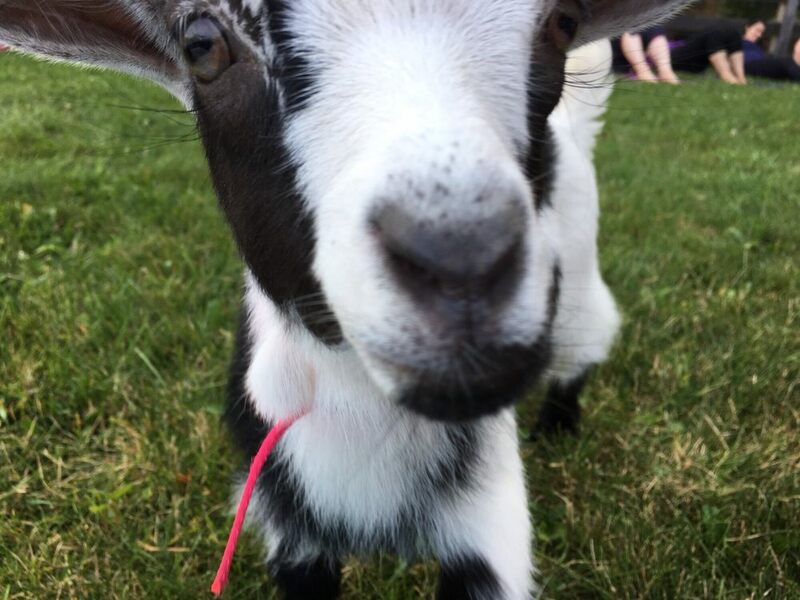 Because baby goats are super cute! They are cuddling and do things that make people laugh. If yoga makes people happy and baby animals make people happy then why not put them together! I like seeing people smile and laugh and goat yoga is a sure bet on that front! I always tell people that well behaved children are welcome. Would you bring your kid to a regular yoga class? If probably yes, then sure why not! If probably no, then maybe it isn’t a great idea. There are multiple dates in August & September. You can buy tickets for all of them on eventbrite.